I have a fascination with dumplings from around the world. Asian-style dumplings are easily one of my favorites, but I'm an equal opportunity dumpling lover, be it pelmeni from Russia, pierogi from Poland, khinkali from Georgia, manti from Turkey, or gnocchi or gnudi from Italy. 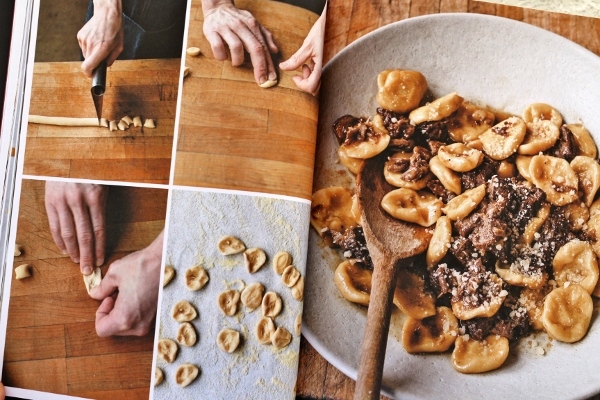 Pasta by Hand by Jenn Louis is a newly released cookbook exploring the culinary delights of Italy by trekking throughout the nation on a dumpling, or gnocchi, adventure. 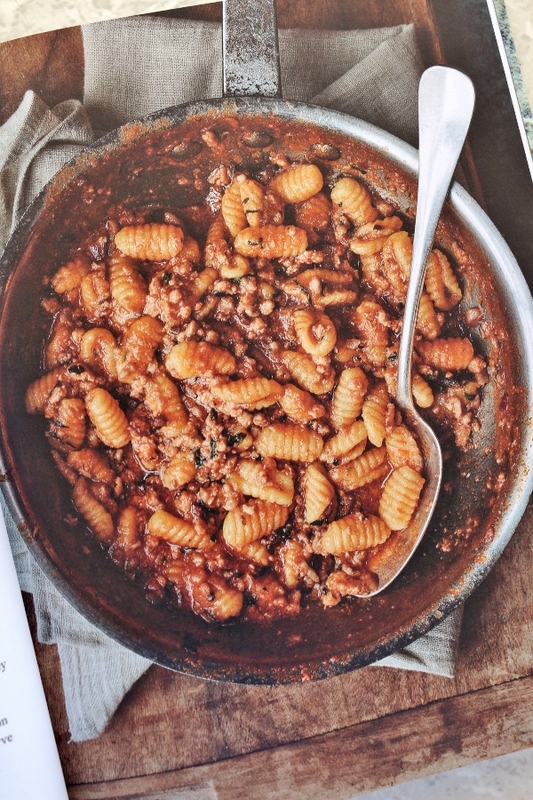 It contains over 65 recipes in a unique collection spanning nearly every region of Italy, from small villages to big cities to capture the incredible range of dumplings/gnocchi from coast to coast, all the way up to the Alps. 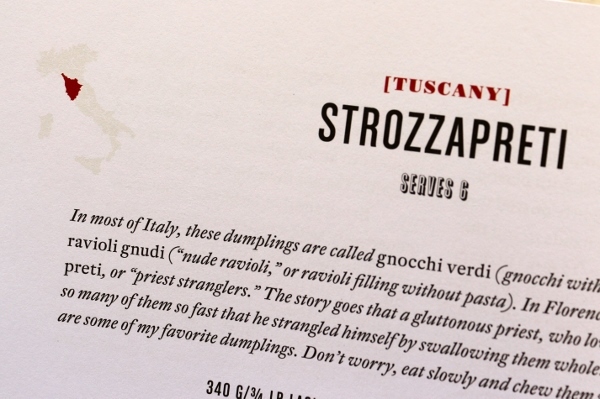 Some of these dumplings use the word "gnocchi" in their names, while others do not, but they all fall into the same basic category of hand formed pasta shapes. 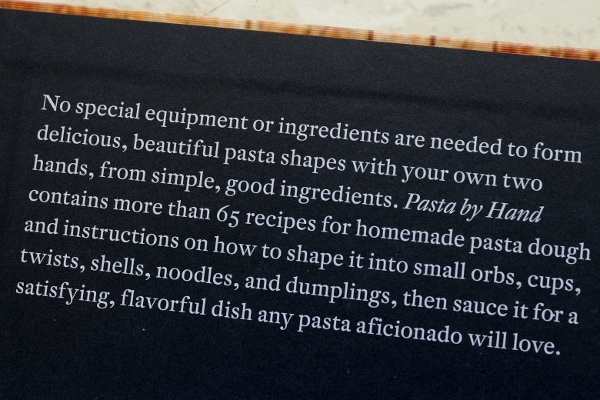 What's wonderful about this book is that none of the recipes require special tools like pasta rollers. It may seem daunting to create the shapes "by hand" but it's really quite simple and not nearly as time consuming as you would think. With the exception of Sicily and Calabria, the remaining regions of Italy are all represented in this book. Some feature a single recipe, while others include up to eleven. Each region's recipes are listed in order of difficulty from easiest to most challenging. 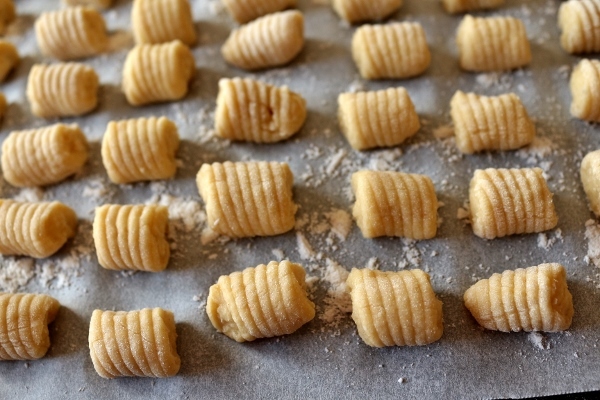 Many of them have identical shapes (either simple nuggets of dough, or ridged morsels created with the help of a gnocchi board or fork), while others are incredibly unique, such as the Cazzellitti ("little hats"), Ciciones (tiny orbs), or Trofie (twists), just to name a few. Lucky for us, there are lots of step-by-step photos throughout the book as well, so these unique shapes can be easily achieved. 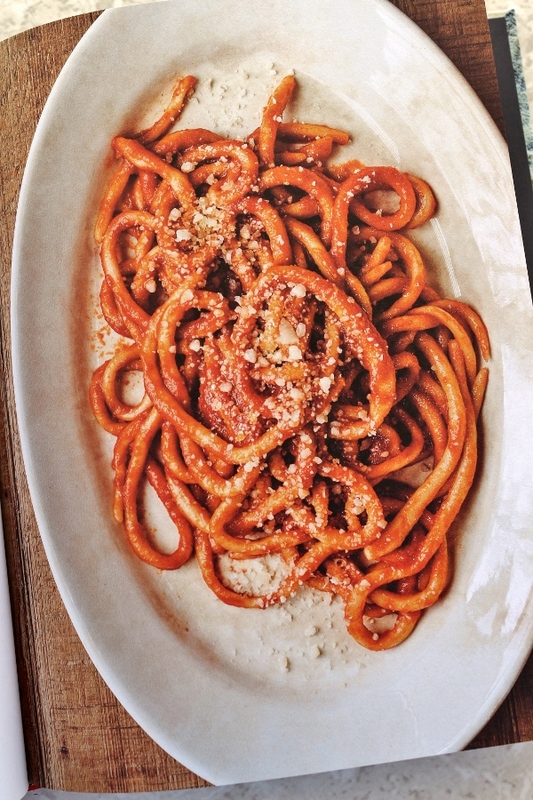 Each recipe includes a tiny little map of Italy with the region it comes from highlighted in red. I wish the map was a bit more of a contrast from the color of the paper--it's basically off white--because it almost looked like a stain on the page when I first saw it, before realizing it was a teeny tiny map. 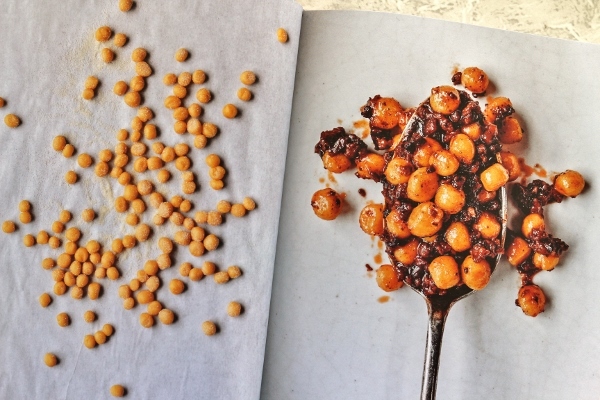 Additionally, each recipe includes a list of sauces that would compliment that particular gnocchi, with a section at the end of the book featuring all of the sauce recipes. They are all classic sauces, since the gnocchi are all classic, not contemporary or creative variations. 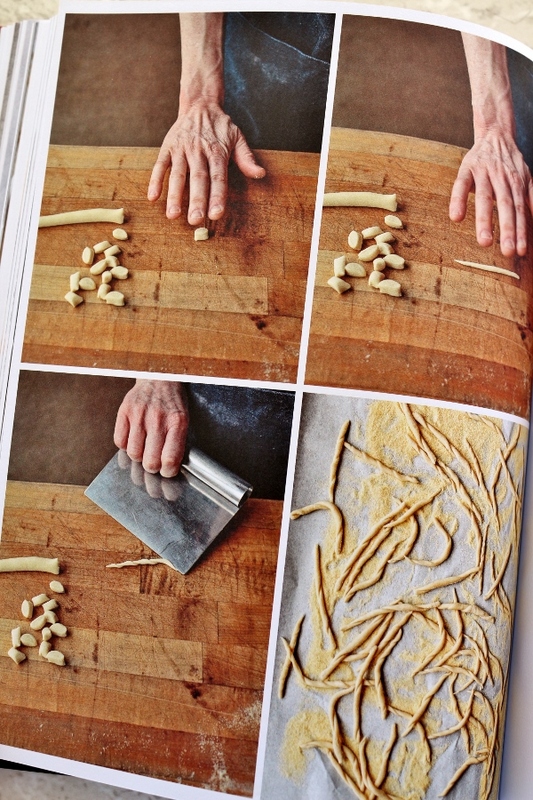 I truly feel like the book is a wonderful exploration for anyone interested in learning more about the many regional differences in hand-shaped pastas. You can see a huge range spanning from the South to the North, where stale bread, breadcrumbs, and dairy are staples in gnocchi preparations. It was nearly impossible to select a single recipe to begin my own culinary exploration, since there are similarities between many dishes. 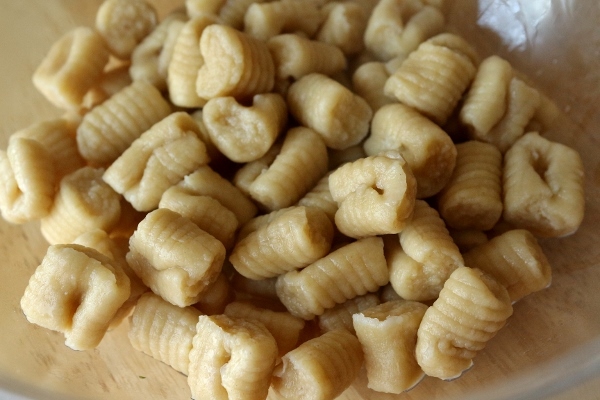 An simple example can be found in a couple of my top contenders: Ricotta Cavatelli and Ricotta Gnocchetti. 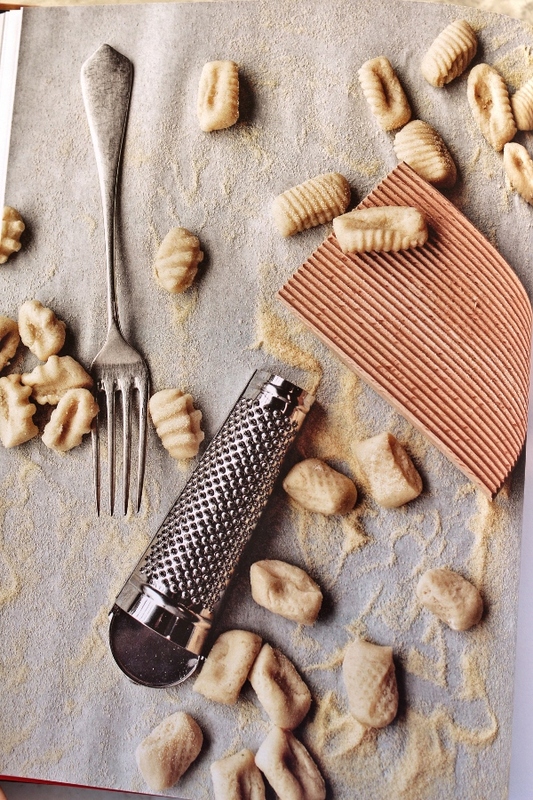 Both contain ricotta, flour and egg, but the Cavatelli seems to use a larger ratio of flour, making it--I would imagine--a bit firmer and denser, and thus easier to shape on a gnocchi board. The Gnochetti recipe also contains grated Parmigiano-Reggiano, but it cut very simply into tiny pillows--no ridges. Recipes that seem vaguely similar at first glace have enough variation to make it worthwhile to try them all! After much deliberation, I decided to start with the Gnocchi al Sagrantino all'Amatriciana. 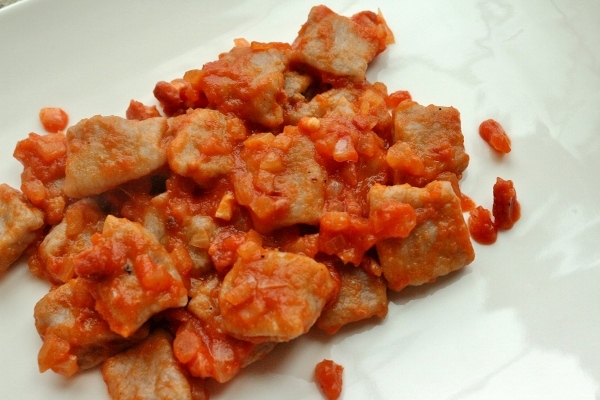 That translates to gnocchi with Sagrantino wine and guanciale-(or pancetta)-tomato sauce. If you Google Gnocchi al Sagrantino, what you will find is gnocchi with a Sagrantino cream sauce. 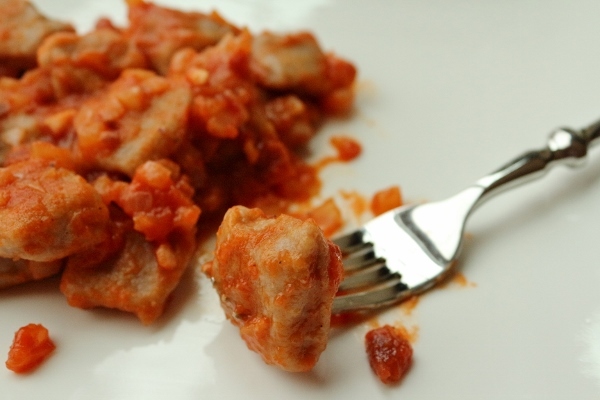 The version in this book (and the one Louis learned in the ancient town of Montefalco, Umbria) mixes the Sagrantino wine directly into the potato gnocchi dough. Louis describes the gnocchi as having a reddish color, although mine were more like a purplish beige. I used Shiraz, so perhaps the color is a bit different than Sangrantino. Regardless of the hue, the point is to get that wine flavor right into the gnocchi themselves. I boiled two potatoes that collectively weighed slightly more than what the recipe calls for (about 19 1/2 ounces instead of 18), and perhaps because of this my dough was a bit too soft. I added more flour to tighten it up a tad, but it was still fairly soft, and even a bit challenging to roll out. Fortunately, this particular gnocchi recipe does not require one to shape it on a gnocchi board, but rather to simply cut into pillows and set on a semolina-dusted tray. Easy peasy. On the plus side, the softness of the dough definitely adds to the tender quality of the gnocchi, so I'm not going to complain. 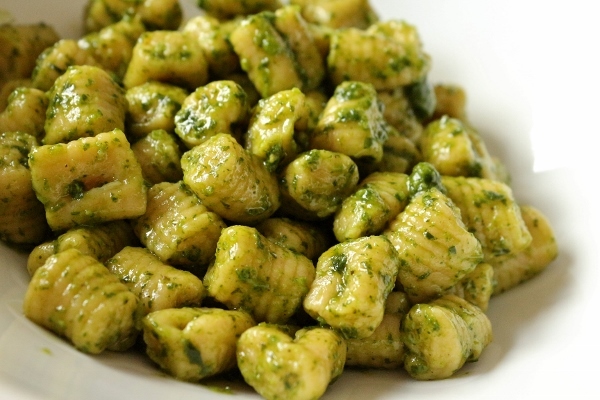 And tender, light-as-air gnocchi is exactly what I got! I actually divided my gnocchi onto two plastic cafeteria trays lined with parchment and dusted with semolina. I plastic-wrapped and froze one tray (and then transferred the frozen gnocchi to a freezer bag) and then cooked the other half the same day. 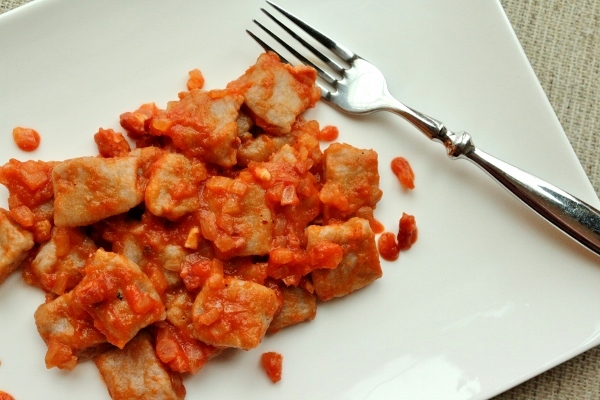 The sauce that accompanies these gnocchi is a classic all'Amatriciana (labeled Guanciale, Tomato, and Red Onion Sauce in the book). You can easily substitute pancetta for the guanciale, which is exactly what I did. I rendered it over medium heat and actually drained off a bit of the excess fat before adding diced red onion to the mix. 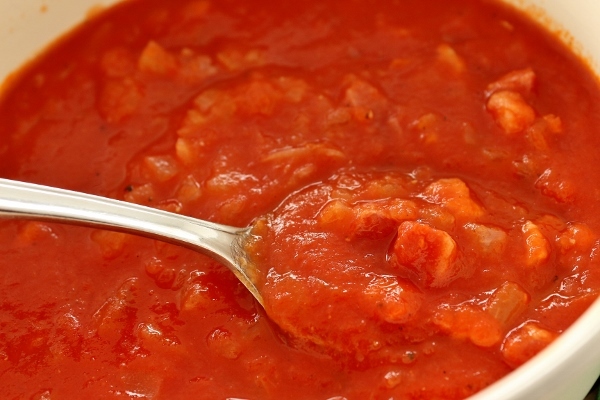 It gets a bit of a kick from some red chili flakes and is finished off with a smooth tomato puree. I just blitzed a can of San Marzano whole tomatoes in my blender and then patiently strained it, pressing on the pulp and seeds with the back of a spoon to get as much tomato through the mesh. I discarded the seeds and maybe a couple tablespoons of actual tomato pulp trapped with my seeds in the strainer. It's worth a little elbow grease to get a nice smooth puree! Alternatively instead of using your blender, you can pass the tomatoes through a food mill with small enough holes to prevent seeds from passing through. I may try that next time myself! The entire mixture then reduces until slightly thickened. The recipe should yield 4 cups according to the book, but in reality I got 3--perhaps from over-reducing a bit--but in any case, it was more than enough! I set aside 1 1/2 cups to use that day with half my batch of gnocchi, and then froze the other 1 1/2 cups in 1/2 cup portions, so I can easily defrost one portion and then cook off a single portion of gnocchi to go with it. Who says gnocchi can't be a weeknight meal?! The result? 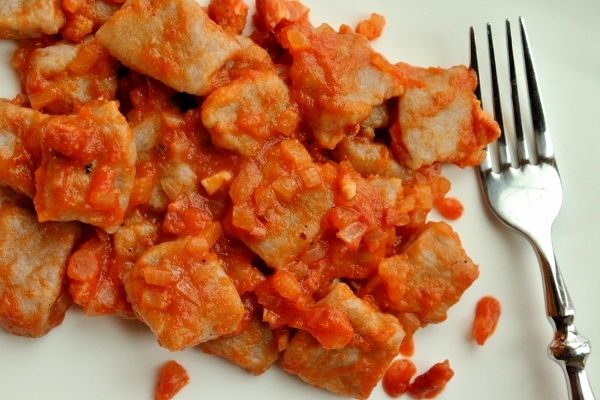 Tender, melt-in-your-mouth pillows with the faint flavor of wine shining through, even when cloaked in a thick, throat-warming tomato sauce studded with crisp bites of pancetta. It's truly Heaven on Earth. Any frustration I had working with my too-soft dough disappeared the moment I took my first bite. A solid two thumbs up! 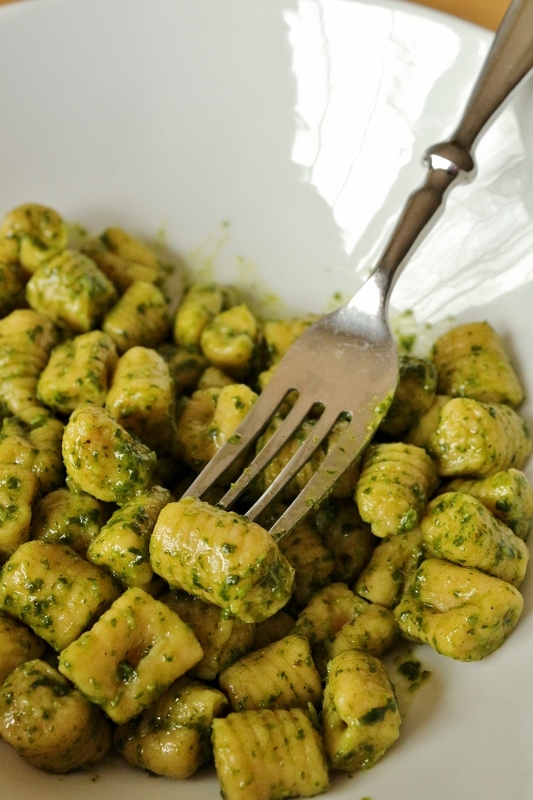 Because one gnocchi recipe wasn't enough, I also made the Chickpea Gnocchetti with Pesto. My nephew can't have gluten or dairy (among other things), so I decided to make half the chickpea gnocchetti gluten-free using Cup 4 Cup Wholesome Flour Blend (which is both gluten and dairy free) and the other half with regular all-purpose flour. I blended the chickpeas, eggs, and water together, then divided the mixture in half and made the two separate doughs, being careful not to cross contaminate any gluten. To differentiate the gnocchetti when shaped, I left his gluten-free gnocchetti in basic pillows, while the classic version got some ridges courtesy of my gnocchi board. I found the gluten-free version to be a bit challenging to roll out into a rope shape, and preferred to squeeze it in my palm into logs instead. I couldn't quite get it thin enough to yield a 1/2-inch diameter, so these gnocchetti were a bit thicker. The traditional version was a cinch to make. It was easier to roll out, cut, and shape on the board. If you don't have dietary restrictions, that's definitely the way to go. Texture-wise, I definitely prefer the traditional version. 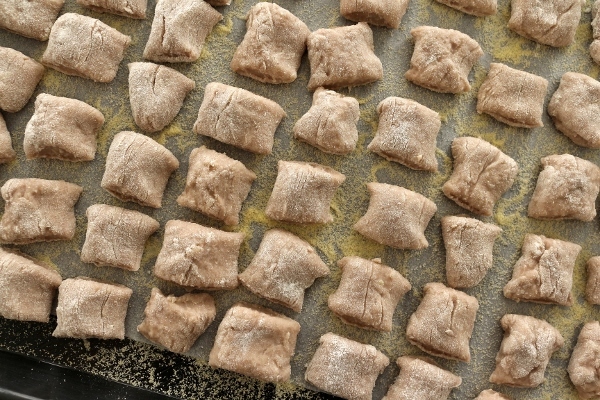 The small bites of gnocchetti are nice and firm and chewy, a contrast to the typical light and pillowy texture expected in gnocchi. 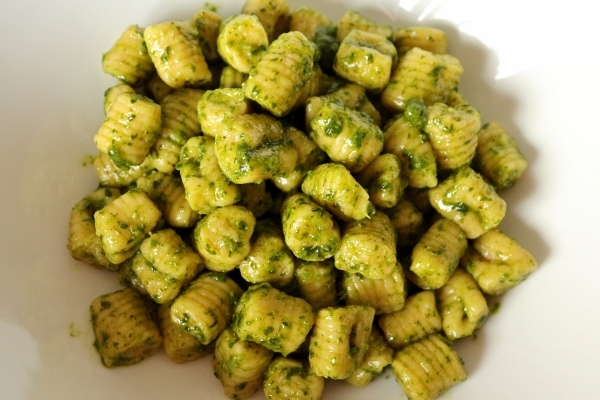 Although there is a pesto recipe included in the book, the one I used with the chickpea gnocchetti is a nut and dairy-free one made quite simply with basil, garlic, and olive oil. It's a nice compliment to these small, chewy morsels. 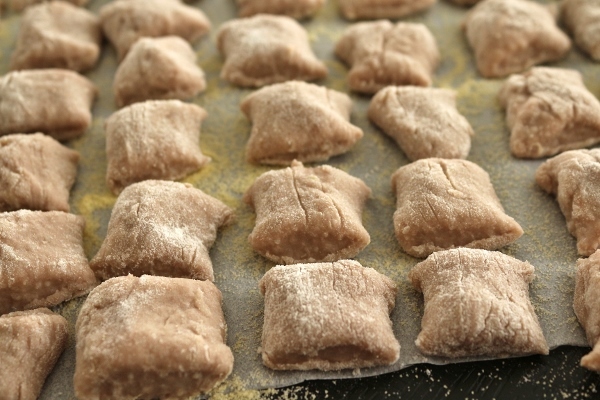 This gnocchetti recipe was incredibly easy to prepare, especially if using canned chickpeas. So, what this whole review boils down to is that I obviously think you should buy this cookbook and make everything in it. 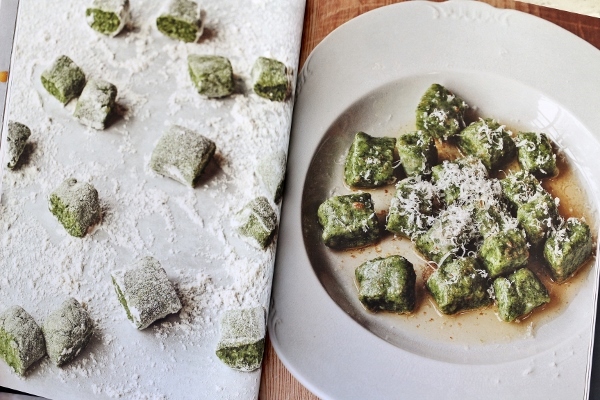 It will make your tummy happy :) If you want to explore some more gnocchi recipes from Jenn Louis and others, check out this feature at Saveur. 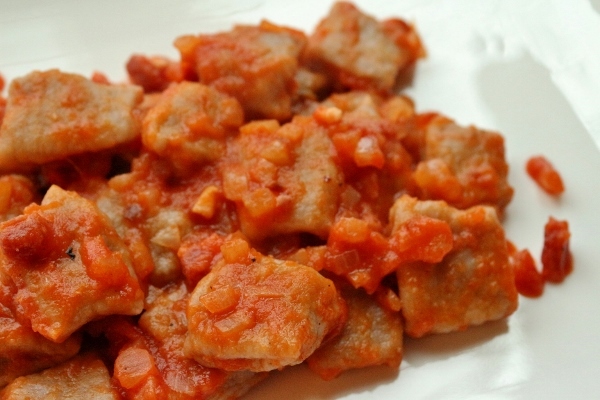 To make the gnocchi: In a medium pot, cover the potatoes with cold water. Bring to a simmer over medium-high heat and cook until the potatoes can easily be pierced with a skewer, 15 to 20 minutes. Drain the potatoes in a colander and set aside to cool. When cool enough to handle, peel the potatoes and rice them into a large bowl using a potato ricer or food mill. Add the wine, salt, all-purpose flour, and egg and mix by hand until the dough comes together (you may need to add some flour if it's especially soft--my potatoes weighed a bit too much and the result was an exceptionally soft dough that really needed extra flour to make up for the excess moisture). 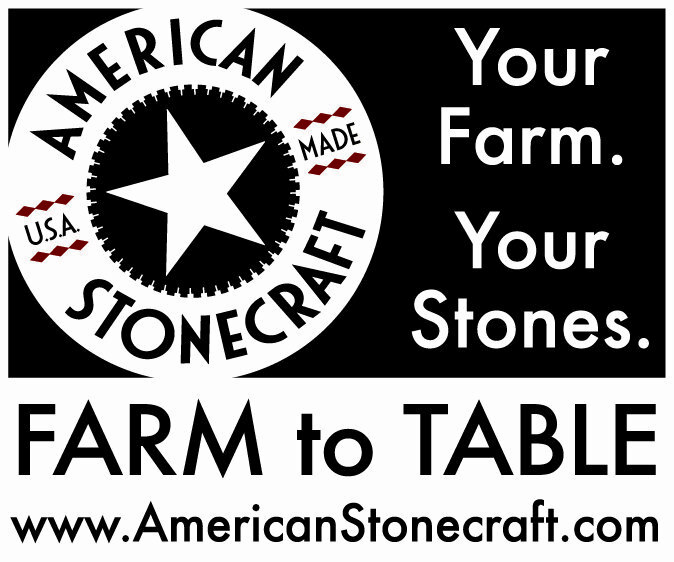 Transfer to a work surface and knead with your hands several times, until the dough is smooth and soft. Cover the dough with plastic wrap and let rest at room temperature for 30 minutes. Line a baking sheet with parchment paper and dust with semolina flour. Cut off a chunk of dough about the width of two fingers and leave the rest covered with plastic wrap. On a work surface lightly dusted with all-purpose flour, use your hands to roll the chunk into a log about 1/2 inch in diameter. 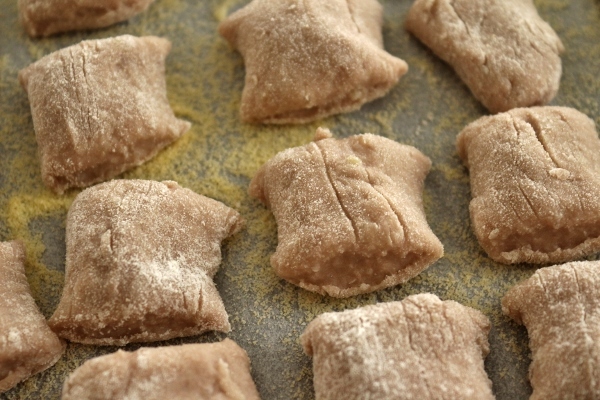 Do not incorporate too much more flour into the dough; add just enough so that the dough does not stick to the surface. Cut the log into 1/2-to-1-inch pieces. 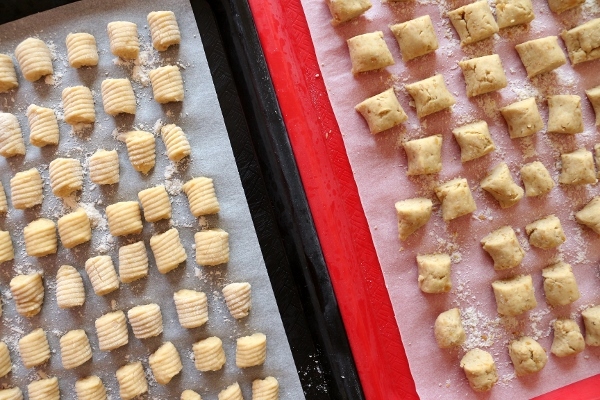 Put the gnocchi on the prepared baking sheet and shape the remaining dough. Make sure that the gnocchi don't touch or they will stick together. To make the sauce: In a large saute pan, cook the guanciale over medium heat until slightly crisp but still tender, 6 to 8 minutes. 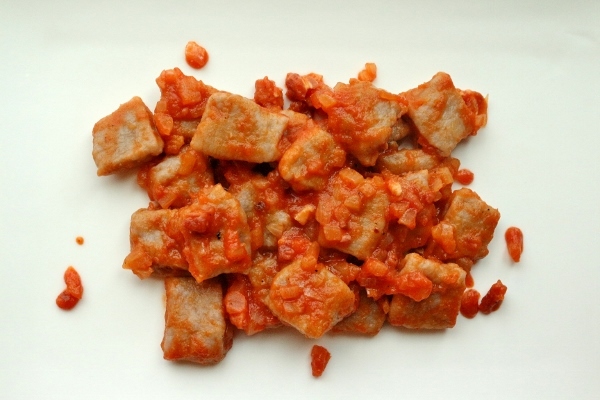 Strain off all but 1 tablespoon of the rendered fat (discard the extra fat or use it for another purpose). Add the onion and cook until it is soft but not browned, about 5 minutes. If the onion begins to brown, lower the heat. Add the red pepper flakes and tomatoes, turn the heat to medium-low, and simmer until the sauce is slightly reduced, 6 to 8 minutes. Season with salt and pepper. At this point, the sauce can either be refrigerated for up to 2 days or frozen for 1 month, or kept hot for serving immediately. Bring a large pot filled with generously salted water to a simmer over medium-high heat. 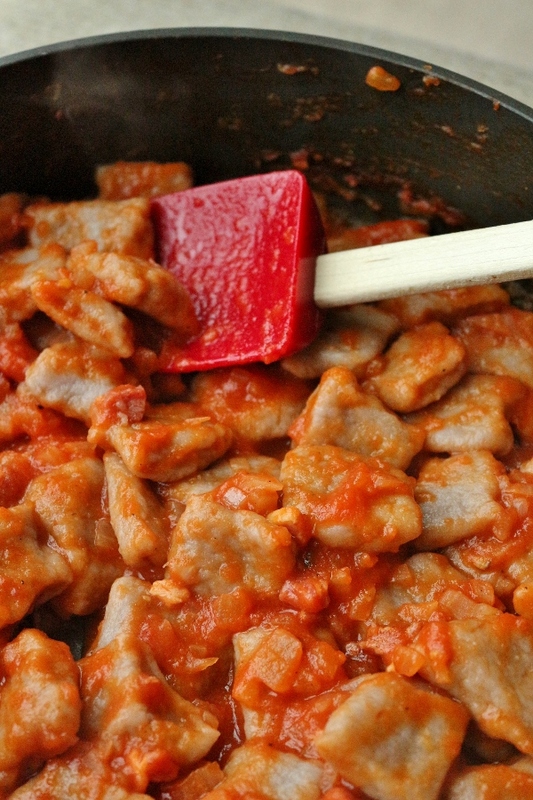 Add the gnocchi and simmer until they float to the surface, 1 to 3 minutes. Remove immediately with a slotted spoon and add it to the saute pan of sauce, along with 1 to 2 tablespoons of their cooking water. 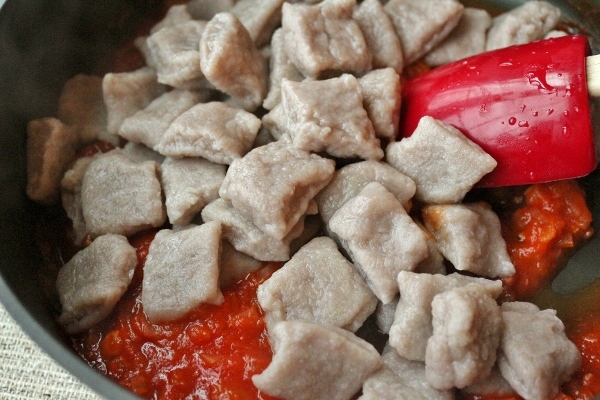 Simmer for 1 minute to let the dumplings absorb the flavor of the sauce. Serve right away with grated Parmigiano-Reggiano, if desired.